Nothing. That's what you can do with an Xbox One directly out of the box. Microsoft talked about this before, but just to reiterate... you can't do anything with it without that day one patch. However, the real catch isn't what it can't do out of the box, but what it can't do after it gets setup. So I've been pretty lazy as far as using the Xbox One goes. I may have made it known that I'm in possession of an Xbox One courtesy of Cinema Blend (not Microsoft) and that it would be a good way to troubleshoot and test some problems, but up until recently I had no reason to actually use it. Following the Killer Instinct debacle I did feel compelled to finally start putting in some time with the system, and there are a few things that I noticed. So, by now you probably know that there is a mandatory patch for the Xbox One just to make some use of the system, but what you probably didn't know was how limited that use was, even after setting it up. If you haven't already watched a lengthy unboxing video of the Xbox One, the basic setup takes between 45 minutes and about an hour, as has been reported by other sites. The thing that got me – besides the lengthy install – was how limited the network options were. Also, before getting into the network bit, I should just point out how absolutely absurd it is that you can't use a home gaming console for nearly an hour right out of the box because it has to do a lengthy update and install. 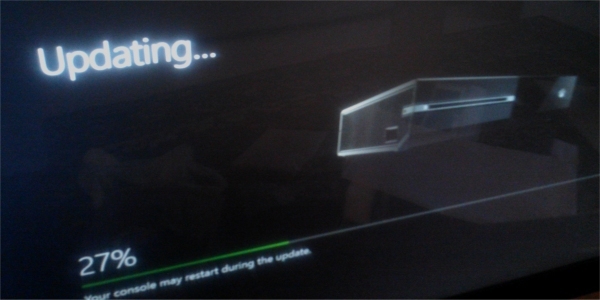 In fact, it took the Xbox One longer to update than it did an Asus all-in-one PC, which managed to do a mandatory update/installation in less than 30 minutes. Compared to the Wii U and PS4 where you can play games once you plug them in – though they still need a day one firmware patch for other features – I think the idea of a gaming console not being able to play games out of the box is a huge step backward for game culture. Anyway, I was prepared to go into a girthy setup screen that enabled me to modify the network settings and options so I could modify and/or cap the bandwidth usage of the Xbox One (I'm still getting and installing Steam games from the holiday sale and, yes, they take priority of the Xbox One at the moment). However, after having the option to choose a wired or wireless connection, there are no other options to modify the network settings, pre-patch. I know the patch is only 506MB, but still... it's basically an all-or-nothing setup. What is this, Arstotzka? After the patch finished the first thing I decided to do was check the network connection settings so I could throttle the bandwidth. Yes, I know you can get software on PC to throttle bandwidth through the router, but the whole point of the Xbox One was that it was for a digital future, one would think that throttling would be a standard option, right? Wrong. Even in the advanced options, the only thing you can choose besides a wired or wireless setup are the DNS, MAC and IP address settings. A digital future without bandwidth throttling seems oxymoronic. On the upside, the downloads don't interfere too much with the bandwidth and it appears the system works itself into a lower queue than other devices on the network, though an option to adjust these settings just seems like it should be a standard. I also find it odd that to be an all-in-one entertainment media hub you would still need something like Qualcomm's Wi-Fi module and PC software or a device similar to the DGL-5500 (and a PC) to throttle the Xbox One's bandwidth or assign it a queue on the network. It's almost an unforgivable sin that a console needs a PC in order to setup some of its network settings. Hopefully Microsoft addresses this in a firmware update. One of our regular readers also suggested that we mess with the RGB settings for full color spectrum features and increased color bits, and I can say that yes... switching the settings from "TV" to "PC" and increasing the color bits (on a screen that supports these options) makes the picture absolutely pop. That's assuming you're into that sort of thing. Nevertheless, I can easily say that I'm not impressed with the Xbox One out of the box. I can also say that the bare bones utility features and user interface settings are things I would expect from a tablet or smartphone but not a “next generation” game console. I also feel sorry for anyone with spotty internet or trouble maintaining a decent Wi-fi connection because it will make the day-one patching process a pain. Thankfully, Microsoft has let the offline emergency patch out into the wild, but you'll still need a PC to help get your Xbox One up to snuff.